My family has been out adventuring without me these past few days so I pretty much locked myself in my studio with my dog and painted and painted and painted. I wanted paint with oils and paint some landscapes. I have a pile of photos from hikes and daily wanderings of scenes that make me stop and take in what is in front of me…piles. And so I decided to give them my time and attention. For this painting I took an old painting that had been sitting forgotten in a corner somewhere and painted over it to give it new life. 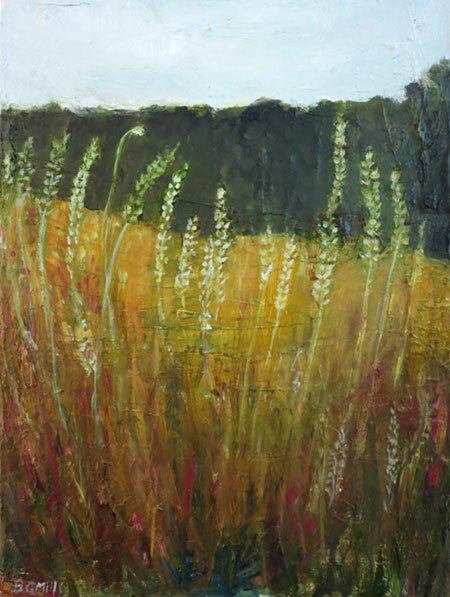 The texture that was already on the surface led to creating a painting of tall grasses of a meadow that I had walked by one fall a few years ago. What if we saw what emerges from the earth as songnotes? …Although the weeds in my garden are not so harmonious to me. I got really behind with my garden this summer. Oh well. For the past few days I completed three paintings, and have four others started. My bowl is full, I feel replenished. Perhaps I can tackle my garden now. I especially love the texture in this one, Bridgette. Really wonderful! It's been a crazy summer--I feel the same way about my garden--I feel like I'm walking into the forest primeval when I walk out back to take out the garbage. we had a lot of rain here this summer and the vegetation is thick!!! Thanks for your comment on this painting. It's very textured which is what inspired me to go in the direction of thick tall grassy meadow.